Let’s face it, laundry is not everyone favorite thing to do. That’s okay. 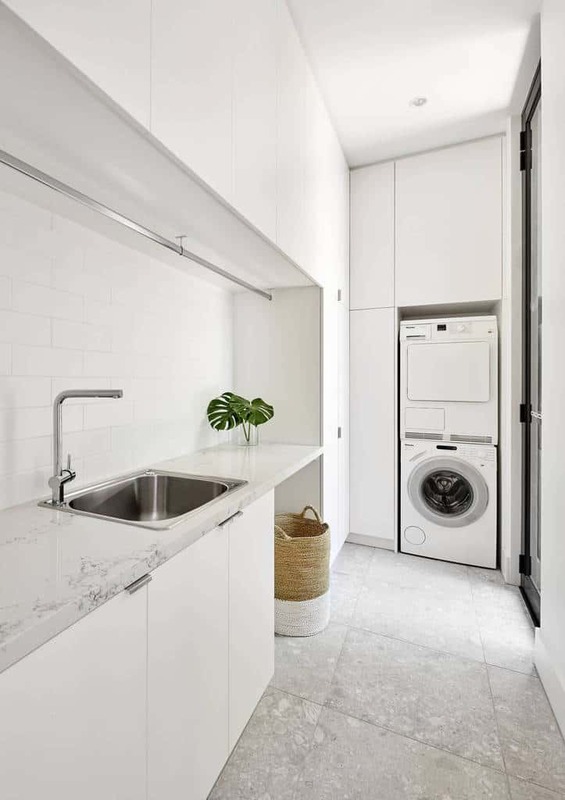 You can make it easier by having a great space to do your laundry in. 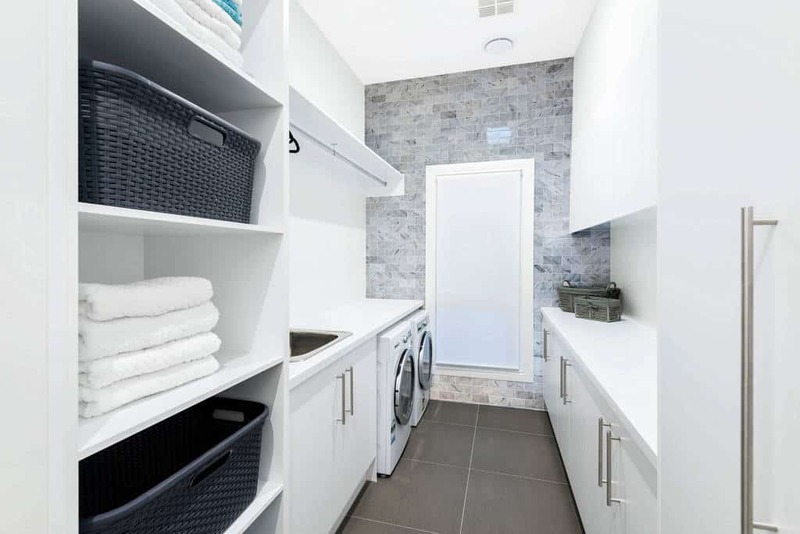 Why would you spend so much time designing the rest of your house and then just leave the laundry room bland? You don’t have to. 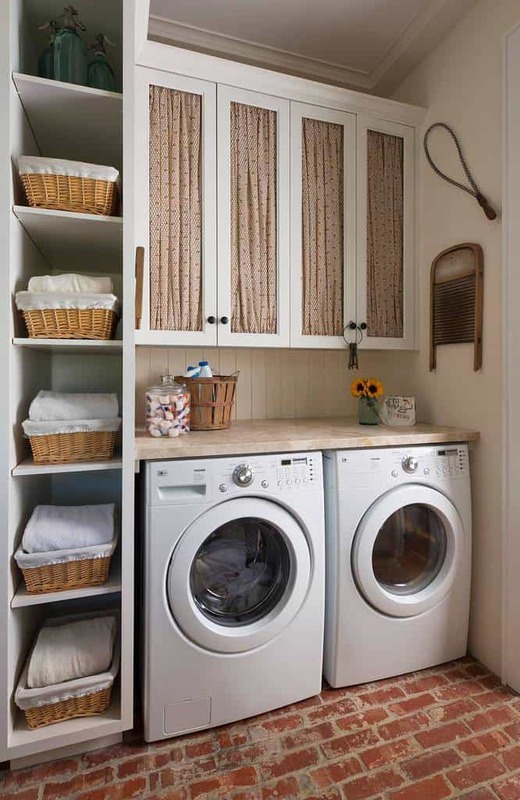 Make sure that every time you go into your laundry room you are happy with the way it looks. 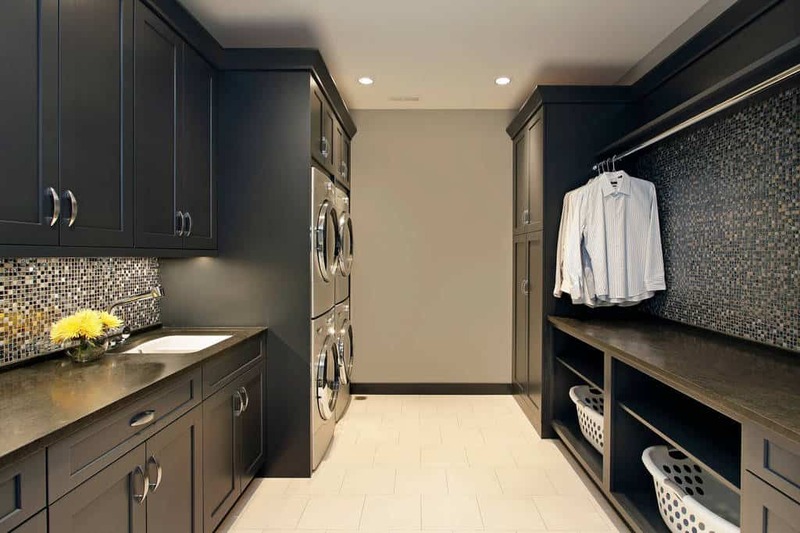 We have gathered together 36 laundry room design ideas. 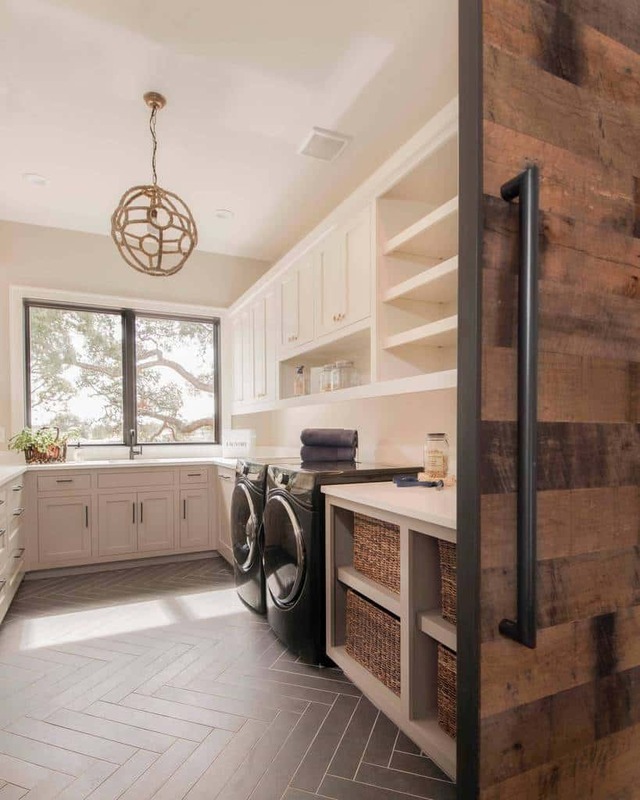 You will see how you can make that space useful for so much more than just laundry. Take your time and look at the different design ideas we have. See how many ways you can use different colors. 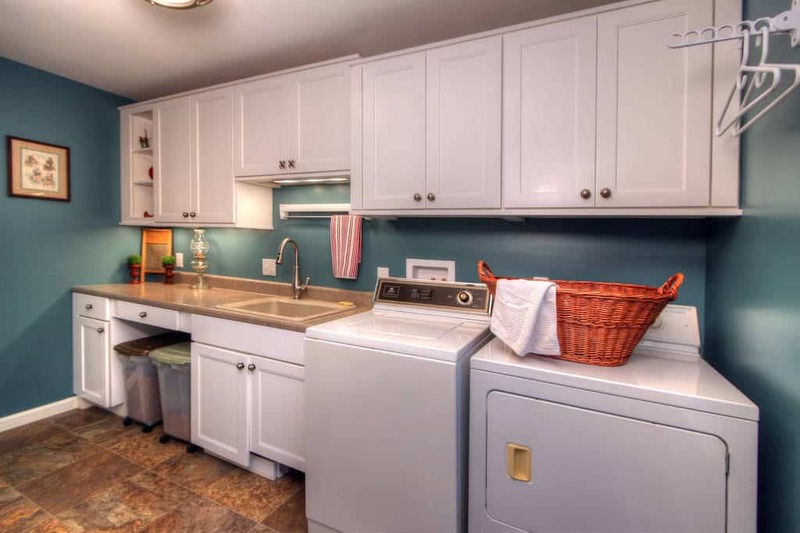 We want to make sure every room of your house is great – even your laundry room. 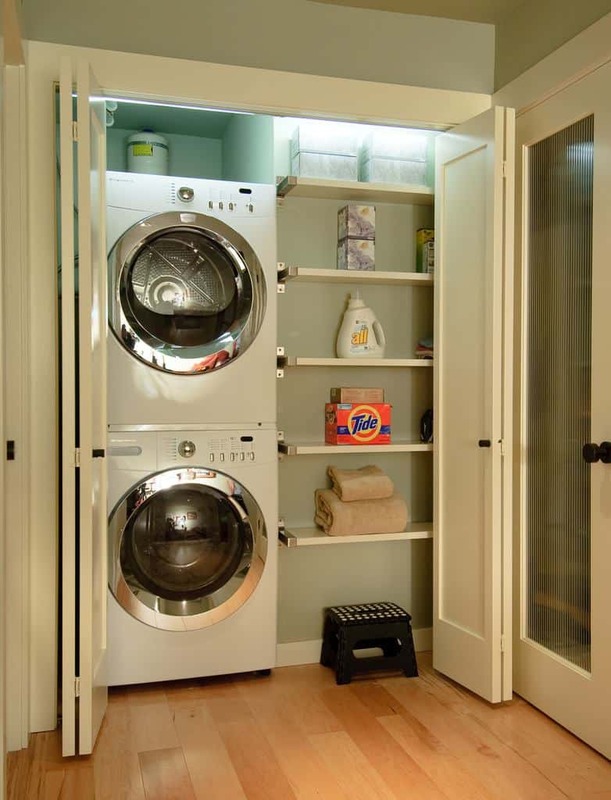 Use a stackable washer and dryer to save some space. They fit right here along with perfect storage shelves. Just close these doors and it’s all hidden. 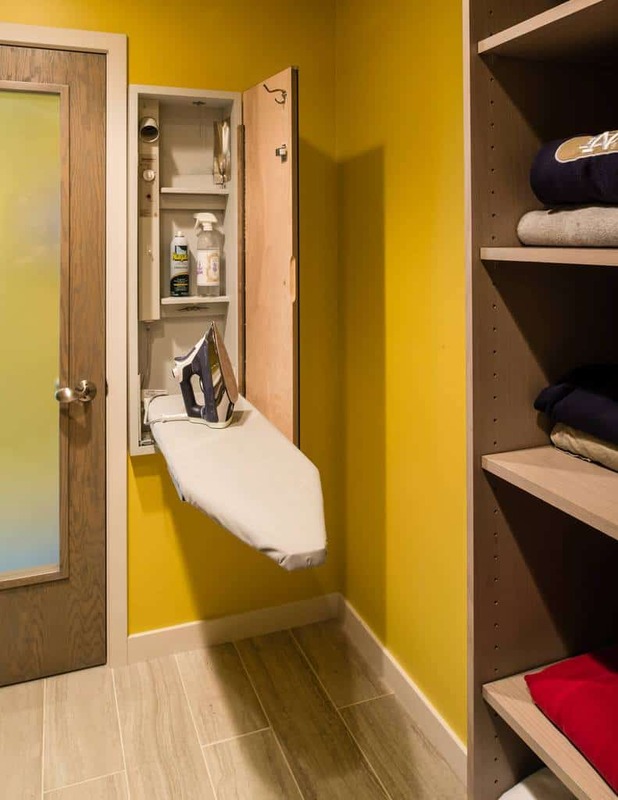 Instead of having to keep an ironing board in a closet, do something like this. It simply folds away when you are finished. These sliding shelves really help save some space. Just pull them out and get what you need. Everything is kept right where you need it. You don’t always have to have a white washer and dryer. These gray models work really well with the color scheme of this room. 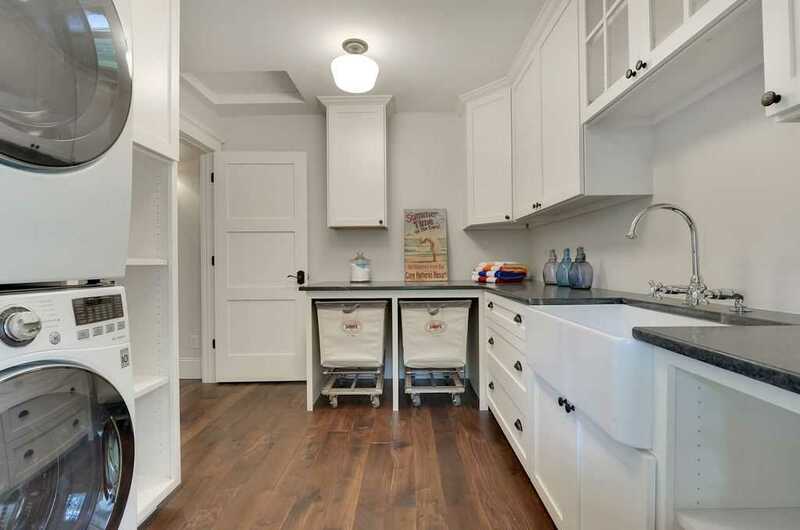 These dark beige walls blend really well with the hardwood countertops and the white shelves and cabinets. The great lighting in this space really shows off the functionality of the room. 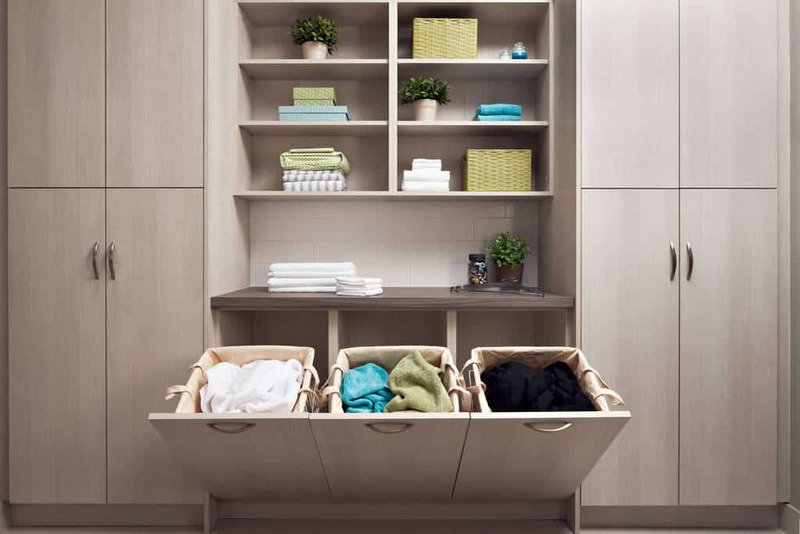 With great rolling laundry storage bins, laundry will be a breeze. 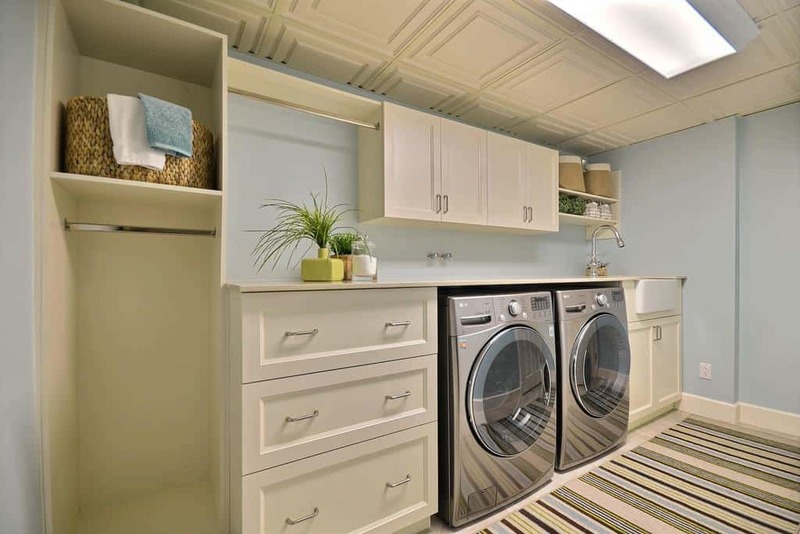 These light blue walls really show off the great hardwood floor of this laundry room. 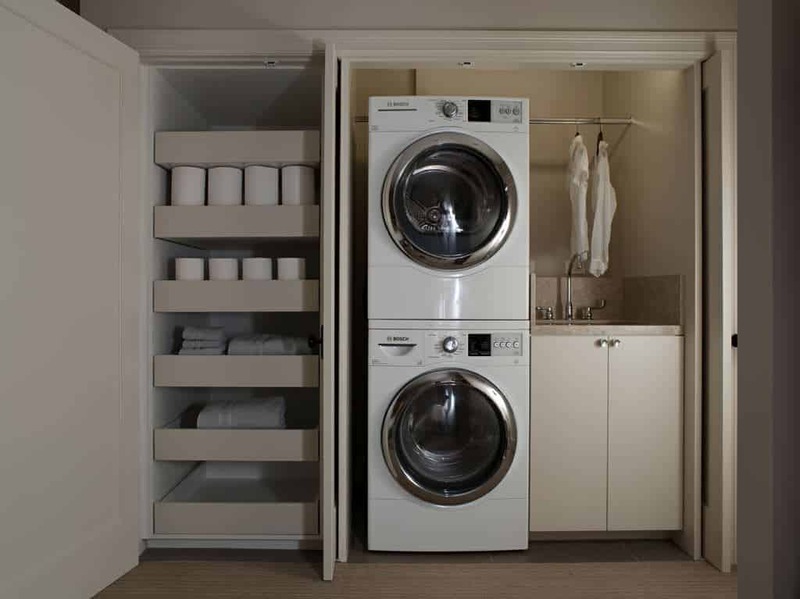 With great designs all around and a space saving stackable washer and dryer, you won’t hate laundry any more. 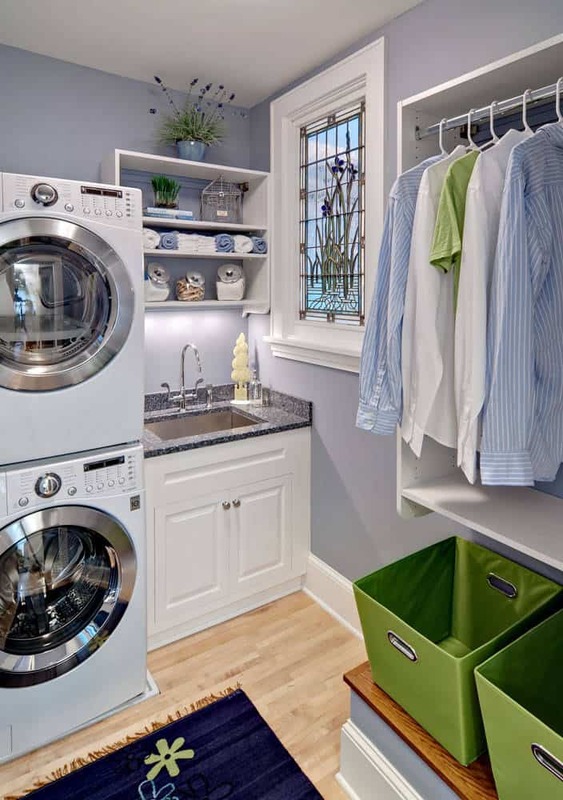 Space is saved with the stackable washer and dryer and you have plenty of natural light shining in from the window. The tiles behind the counter have a great pattern that gives the room some character. Everything blends together, from the hardwood floor to the counter. The chevron style floor brings great texture to a room that already has beautiful decor. The sliding hardwood door will welcome you in. 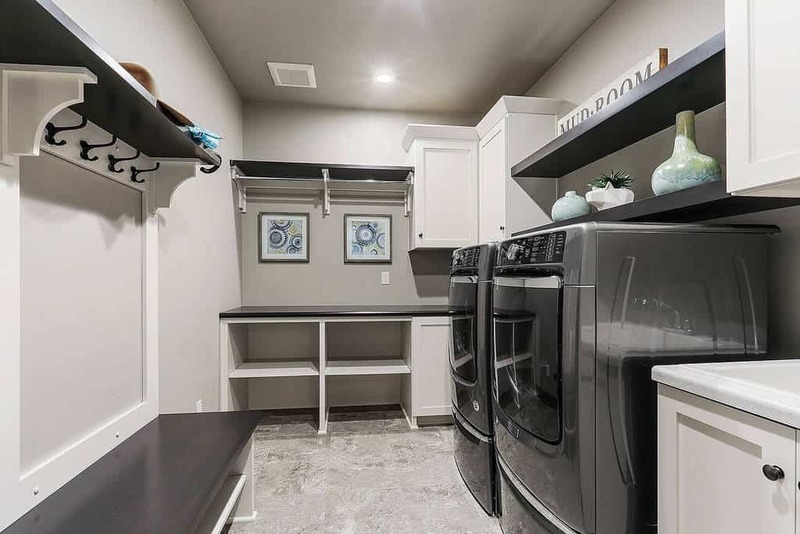 This washer and dryer area is kept behind this sliding door for easy access when you are ready to tackle your laundry. 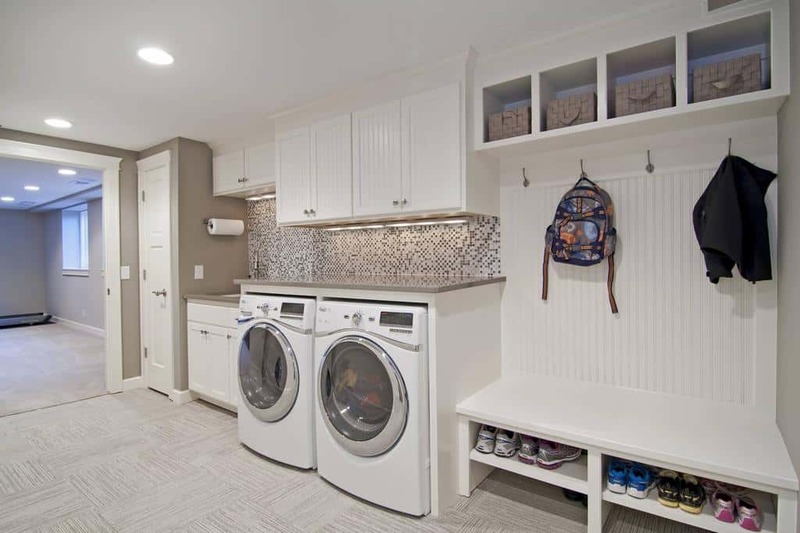 With a great exposed brick floor in this room and wonderful country style throughout, this is a fantastic place to do your laundry. These little tiles blend white, gray, and black together to make a great match to the darker colors around the room. 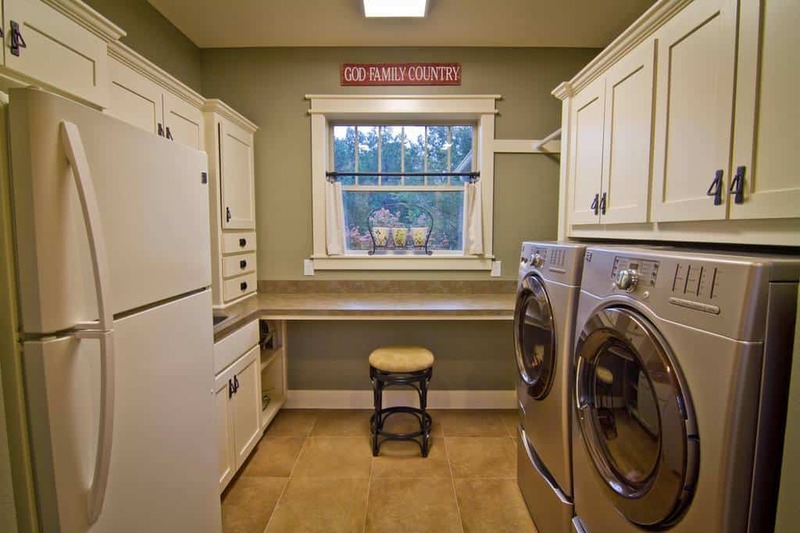 This farm style stainless steel sink is functional and ready to handle any need you may have in this laundry room. 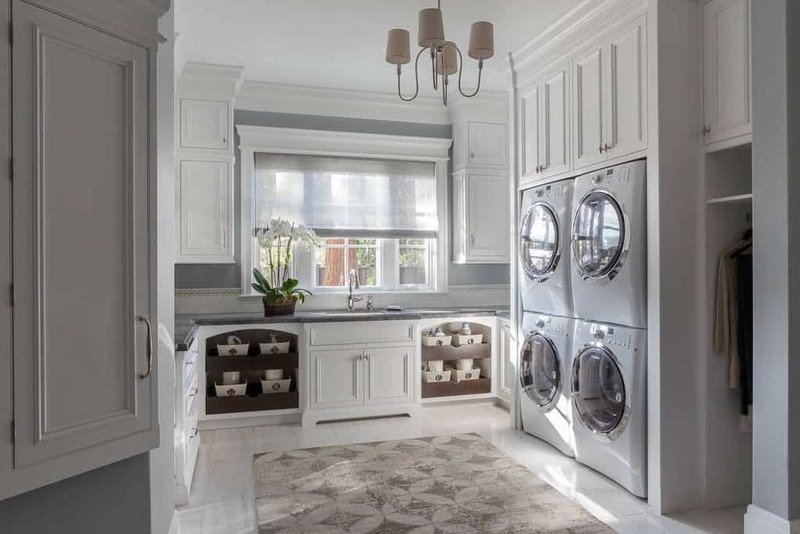 Photo by Spectrum Interior Design, Inc.
Who ever said a laundry room can’t be elegant. Check out this space and you will know differently. The designs and colors in this room are classic and beautiful. 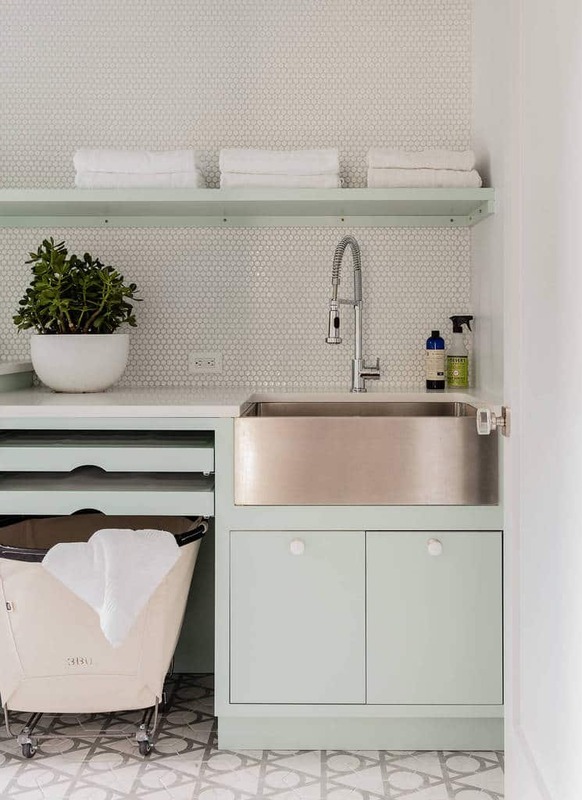 With wonderful use of blue and beige, this laundry room is calm and functional. 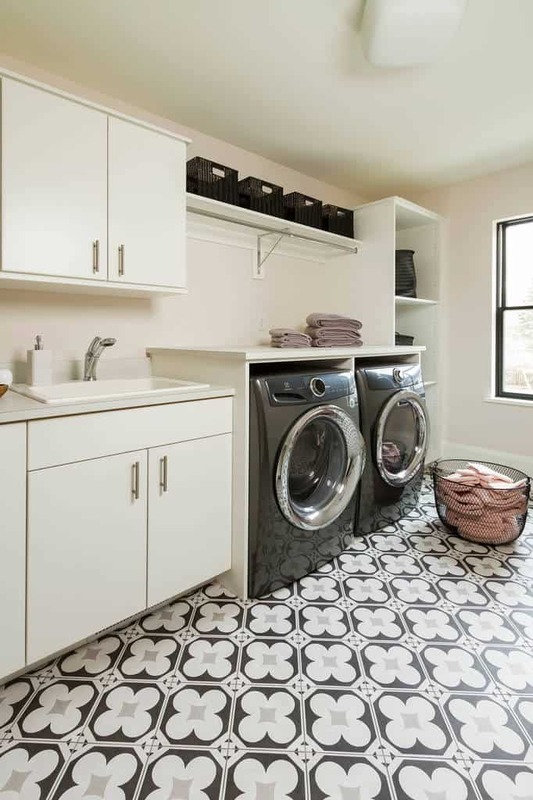 With a wonderful rug to match the space, you actually won’t mind going in the laundry room. 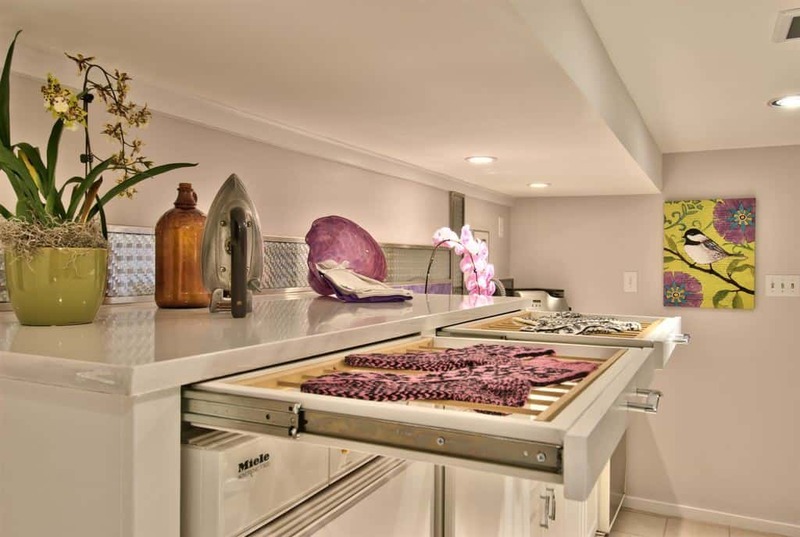 Need extra space for a refrigerator? Of course you can keep it in the laundry room. Sometimes people just need extra space for food. Five kids, anyone? The joy of this room comes in with the wonderful brick style wall. It ties the design and colors of this space together. 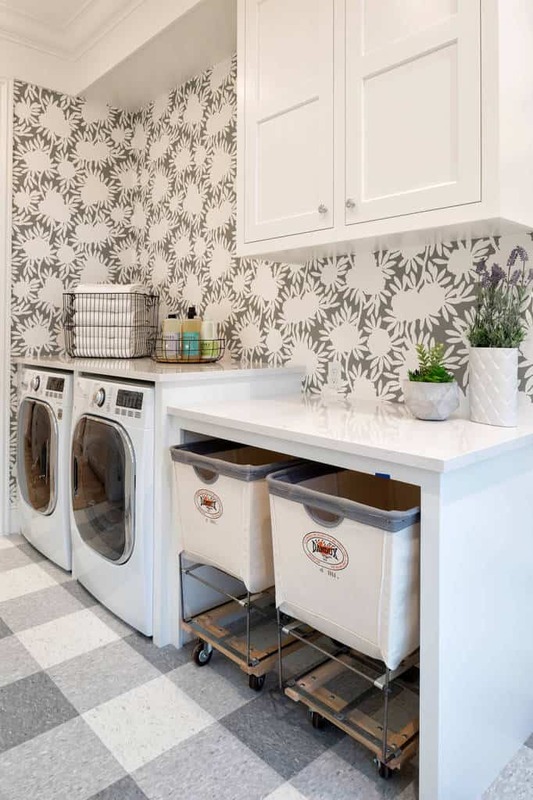 The wallpaper is alive and fun and you have rolling bins to make laundry easier. Dare we say that laundry can be fun? 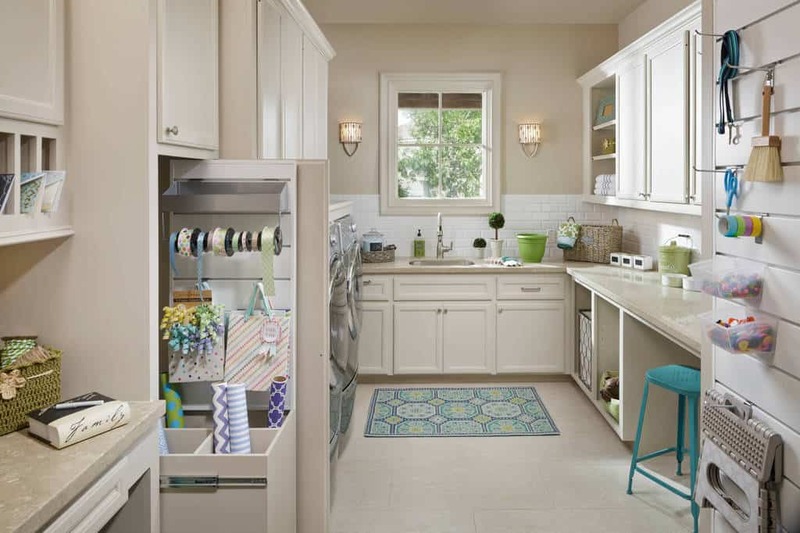 When you or the kids come in with a mess, this space will let you handle it. Dirty clothes can go right in the laundry. Instead of hanging drying racks all over the room, you can get custom racks that simply slide out when you need them. 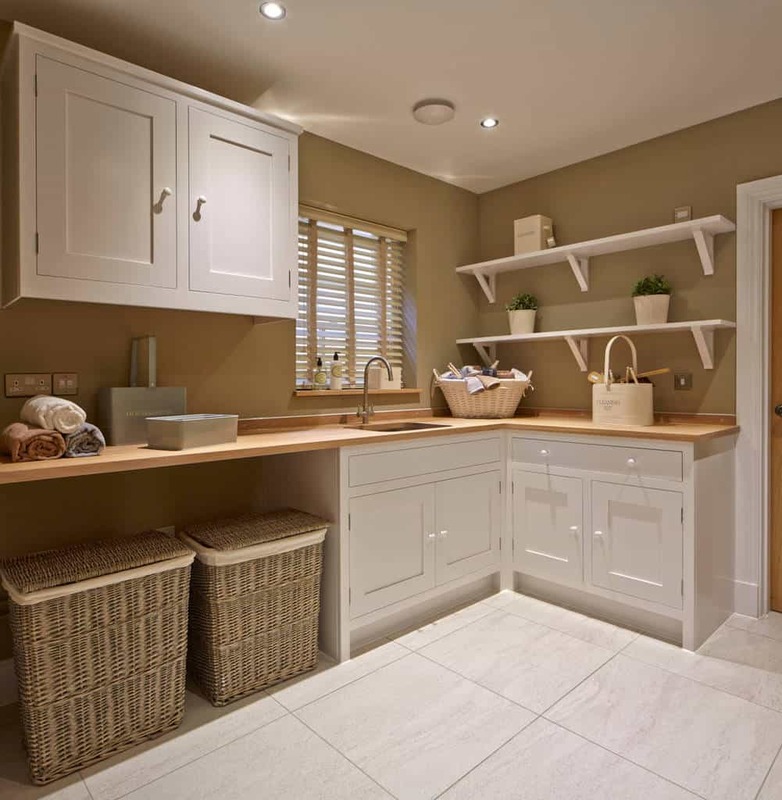 With a large farm style sink to help with any mess you may have, this laundry room is functional. 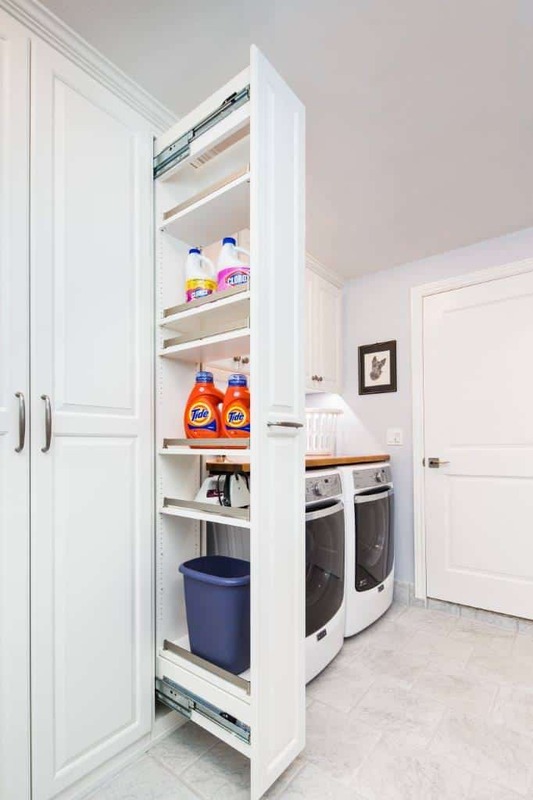 With sliding bins to make everything easier, you can get laundry done quicker. 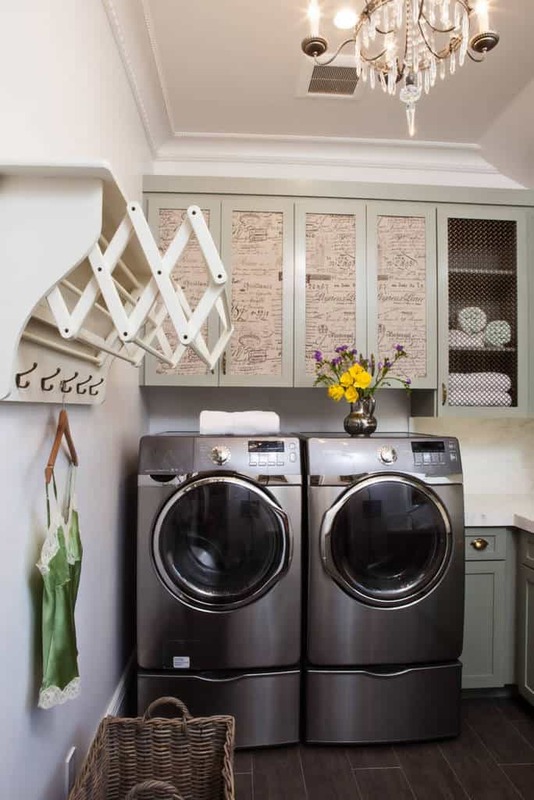 Your laundry room doesn’t have to be bland. Color the walls and give it a great floor to liven up the space. 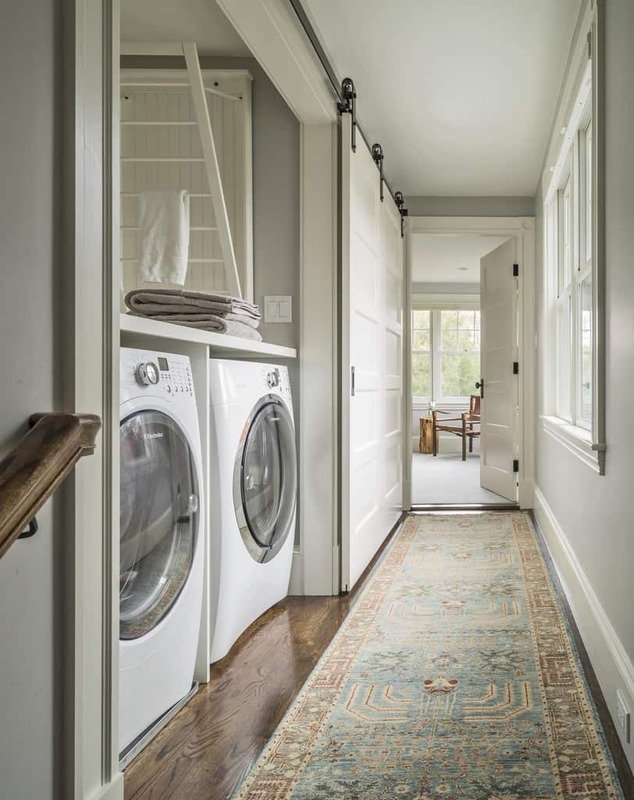 This laundry area fits away nicely behind these doors, only to be seen when in use. 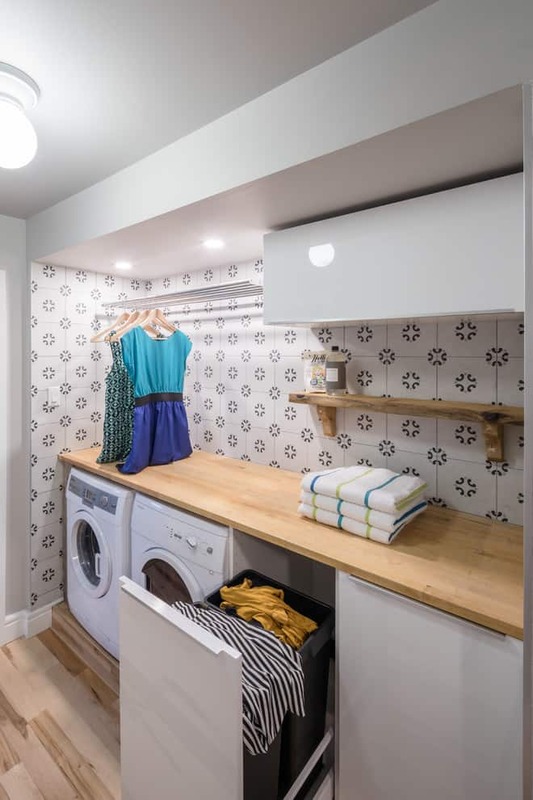 The stackable washer and dryer really save some space. When you have a beautiful hardwood floor like this, you don’t have to do much else to a room. 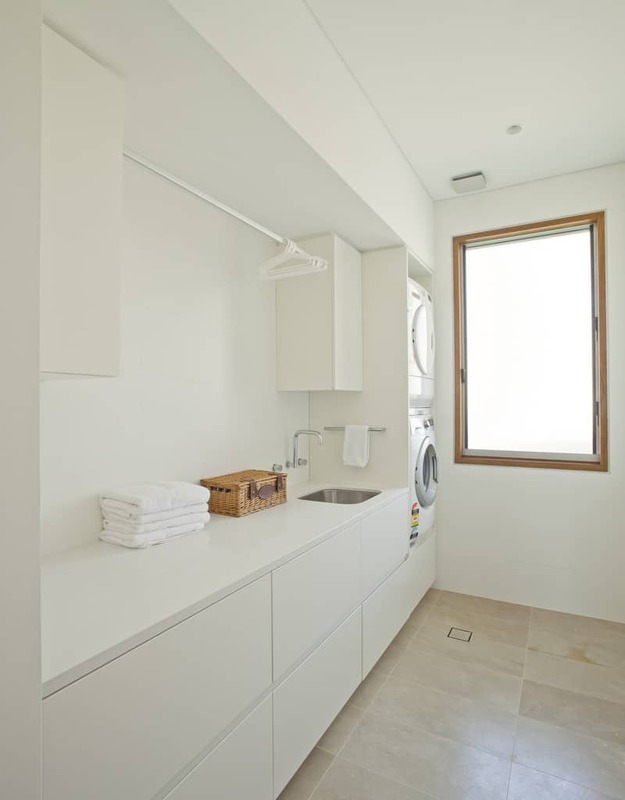 This laundry space is clean and organized. Make it easy to feed the pets. 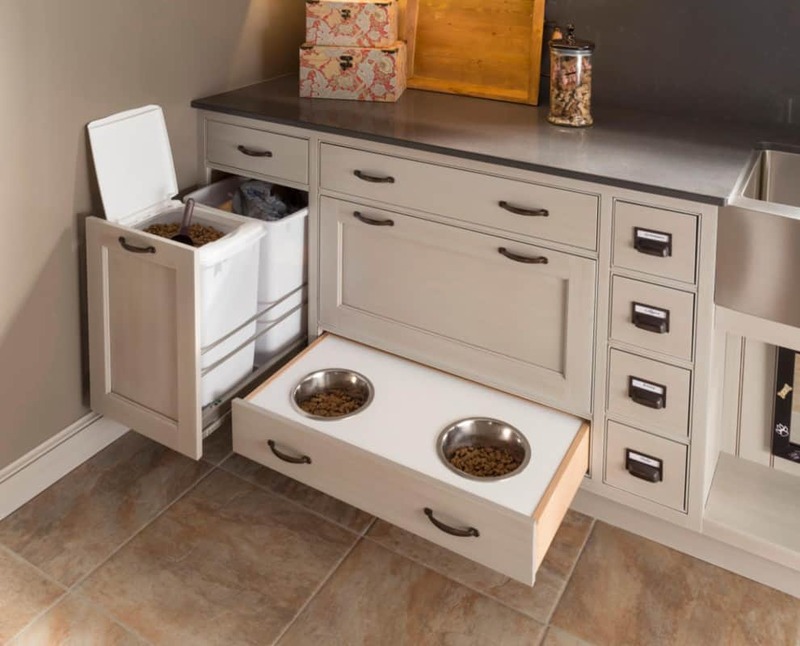 These storage drawers take away the need to make a mess every time it’s food time. 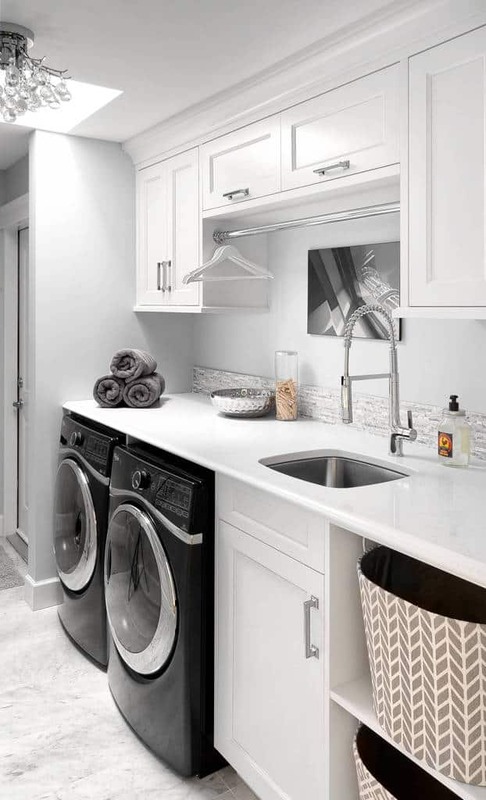 With wonderful silver appliances, you can get the laundry done in style. If you need the drying rack, just pull it out. 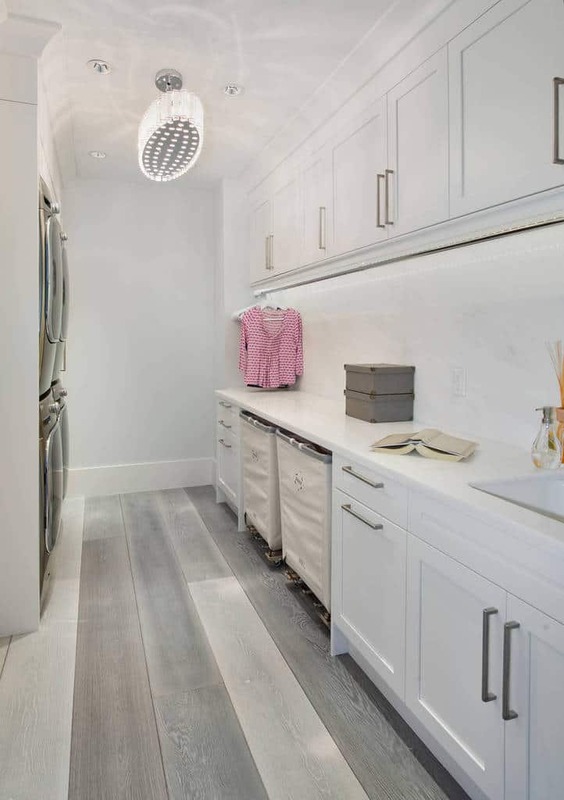 This sleek and convenient space is ready for you when you need it. Just open up and fold down the ironing board. Photo by South Shore Cabinetry Ltd. These darker colored appliances really make a good contrast to the colors of the room. With great decor, you will not mind being here at all. This space will keep all of your item organized when you come in and you can get some work done. This great patterned floor is matched by the darker appliances and white of the rest of the room. With great natural light coming in, you will feel great in this room. Keep the dirty clothes neatly stored away with these fold out hampers. 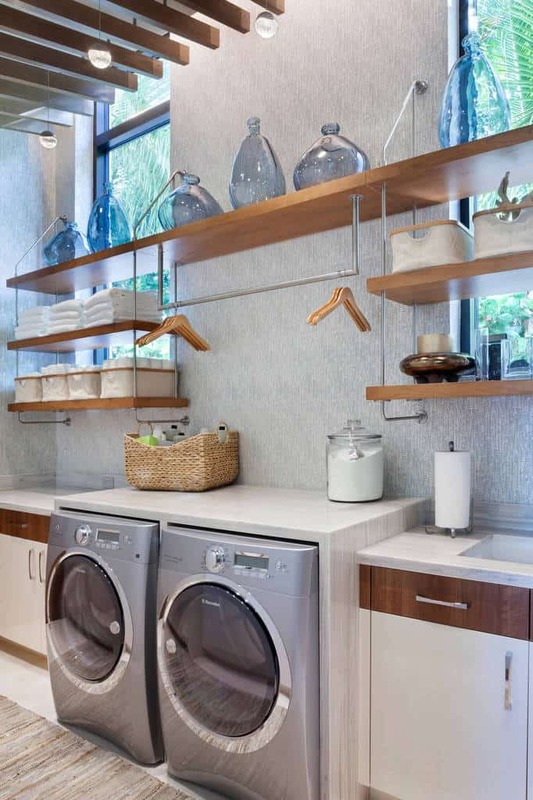 This laundry room is calm and peaceful thanks to great designs. This room is certainly functional. 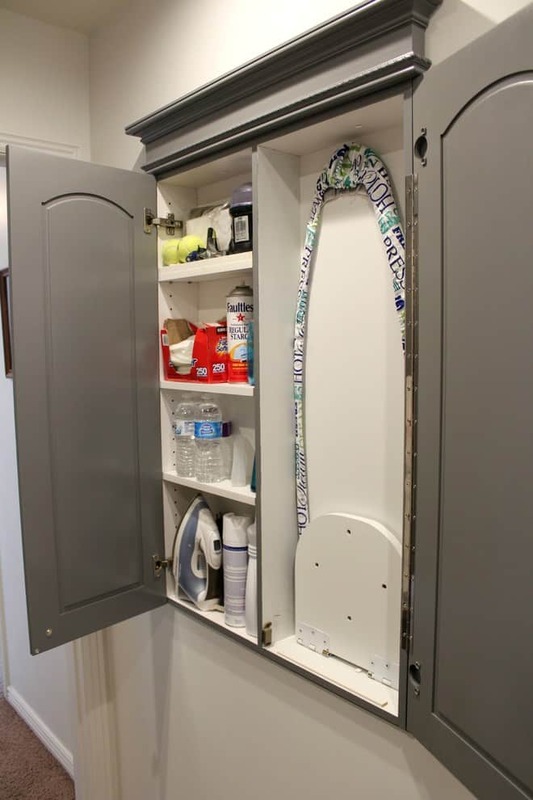 Keep all of your supplies neatly stored away and ready to use and, when you’re ready, get to the laundry. The color schemes of this room really work well to bring the space to life. These shelves in front of the windows look really great. 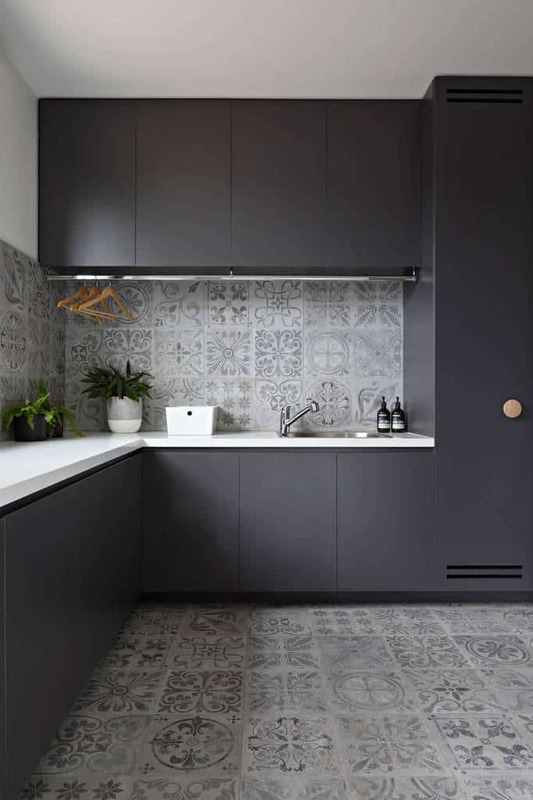 With wonderful patterns on the wall and floor, these dark cabinets really look great. The white counter top is a perfect contrast to the rest of the room. 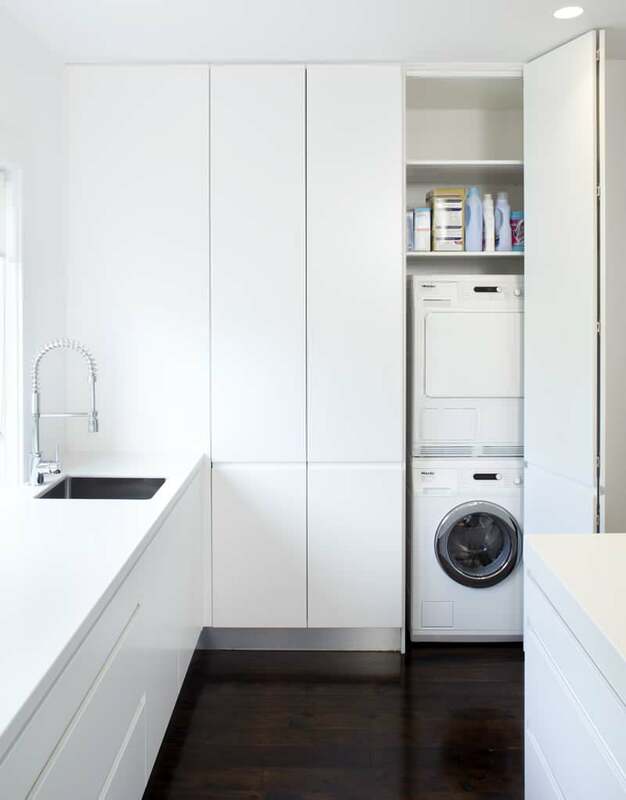 This laundry room saves space by using a stackable washer and dryer. The marble counter top looks great and matches the floor.